Utah’s proposal to divert the Bear River upstream of the Great Salt Lake would dry up tens of thousands of acres of the West's largest remaining wetland ecosystem and cost taxpayers billions of dollars. Trading wetlands for lawn water. Utah is proposing to divert 20-25% of the Bear River, which is the primary water source feeding the American West’s largest remaining wetland ecosystem, the Great Salt Lake. The project is being purused to provide municipal water to the Wasatch Front, most of which will be used on lawns. This $2.5 billion water project will divert 300,000 acre-feet of water out of the Bear River each year, enough water for 2.4 million Americans’ annual water needs. The diversion will significantly lower the level of the Lake, destroying massive sections of internationally significant wetlands and impacting millions of migratory birds. Project proponents have not provided any documentation of the need for the water and there are a number of less expensive and less destructive alternatives to provide more water for Utah’s growing population. However, spending advocates and their army of lobbyists are working to advance the project — no matter the consequences. No place to land. The wetlands that will be destroyed by Bear River development, including the federally managed Bear River Migratory Bird Refuge, are a critical habitat for 8 million migratory birds. Birds from over 230 species stop at the Lake coming from as far south as Chile, north to the Arctic Circle and as far west as Siberia. Many species gather at the Lake in larger numbers than anywhere else on the planet. 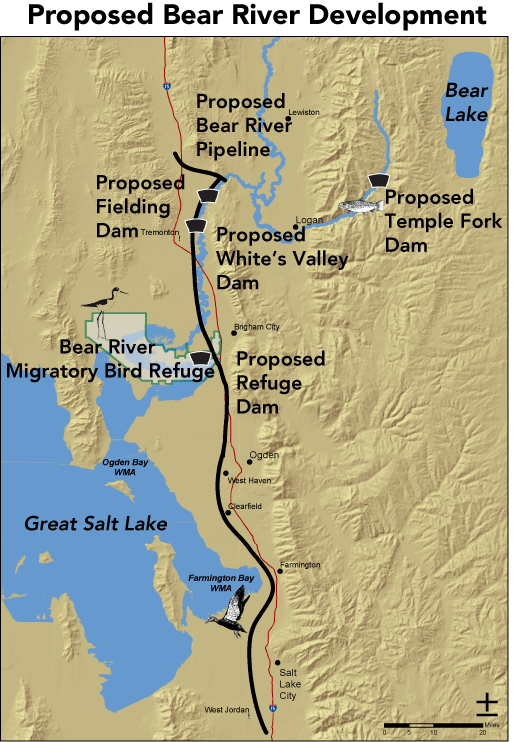 Utah water project salesmen have not studied the impacts of their diversion upon the migratory bird species dependent on Lake wetlands. Exorbitant cost, no benefit. The project will include at least 3 new dams and a 90 mile-long pipeline costing a staggering $2.5 billion just for construction. This will cause large increases in water rates, impact fees and property taxes to repay the debt—consequences that will impact Utah families. Unleashing a public health disaster. Northern Utah’s geography creates a natural trap for air pollution, specifically small airborne dust particles. Because the diversion will lower the Great Salt Lake, dust from the vast areas of exposed lake bed will become airborne when winds sweep across the area contributing to even worse air quality in the Wasatch Front—a region that already has some of the worst particulate air pollution problems in the nation. The Bear River and Great Salt Lake need your help. It’s not too late to save the Bear River and Great Salt Lake ecosystems from this disastrous water project. By reducing our water use and urging our elected officials to pursue the wide range of inexpensive alternatives, we can put this bad idea to rest.